going through, and not at all concerned to understand and/or help, if need should arise. If the last one is true, I won't congratulate you, but as someone who has suffered severely from the many issues tackled in this book (including anorexia, suicidal thoughts and depression) maybe I can't even understand your mindset. Point is, whether you yourself are struggling or would like to educate yourself about what other people are going through, then this is the book for you. 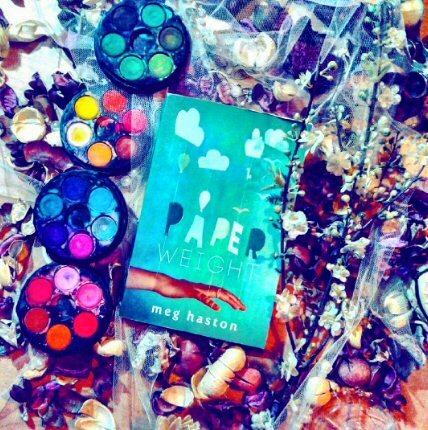 Paperweight by therapist/author Meg Haston (I mention that she's a therapist because, boy, does it show in the book), is about seventeen-year-old Stevie. Stevie is trapped. In her life. And now in an eating-disorder treatment center on the dusty outskirts of the New Mexico desert. Before I go any further, let me tell you one thing: this book is not what you probably expect it to be. It has little to zero sympathy for anorexia, and a bit misplaced insider stuff, because it's mainly written from the view of the therapist. That is to say, the book's POV is a patient's, who also is a teen, so technically this is YA, but right now I am in a place to appreciate and be helped by this book's 'tough love' that I wasn't always in. Facts and feelings are sometimes described with such formality and coldness, that I almost felt that this book didn't understand me, you know? But after that, I always felt that I was in a place where I could be understood, and, more importantly, helped as I had probably never been before in my life. It's like looking inside the brain of a person qualified to help you, someone who is supposed to have 'all the answers' from a caring point of view, and from a sufferer's perspective. I didn't care for the backstory, which was a bit vague and a bit unnecessarily packed with teen drama and improbable situations, but thankfully it didn't take up too much of the book. I mean, come on now. If you're a therapist, you'll know that it doesn't take a 'I think I killed my brother' to send you over the edge. We carry our worst demons inside of us, and they can surface with the slightest of reasons. Parents divorce, classmates bully, friends leave, relatives die. It kind of makes the rest of us look guilty if we're ill for a less reason than thinking we killed someone, as though it's our fault if we're suffering for no dramatic reason. And there's nothing further from the truth. The rest of the book, however, was filled with passages that you might want to mark and give to your relatives/friends to read, so that they might try to begin to understand you better, if you understand what I mean. P.S. If you understand what I mean, I'm sorry. It means you're probably in a place where no one gets it, and I've been there (still am, sometimes) and it's not an easy place to be. So I just want to tell you, you're not alone. Also, grab this book. It will help.